There’s nothing Professor Martin Truffer (UAF) likes better than working in his own back yard and, thankfully, for the glaciologist, Alaska is a big back yard. A veteran of glacier studies in Antarctica and Greenland, he’s happy to bring it home in his new three-year project funded by the National Science Foundation. Truffer, along with collaborators Alessio Gusmeroli, Chris Larson, Jenna Zechmann, Thomas Hurt, Elias Sturm (UAF), Roman Motyka and Jason Amundson (UAS), and Jeff Kavanaugh (JIRP), will study Taku Glacier in detail. The glacier is an Alaskan anomaly because it has been advancing for more than 100 years despite a warming climate. Taku Glacier originates in the Juneau Icefield, the Western Hemisphere’s fifth largest icefield. Located in southeast Alaska’s Coast Range, the Juneau Icefield extends from just north of the city of Juneau into British Columbia. Of the Juneau Icefield’s twenty largest glaciers, Taku is the only advancing glacier, which puts it among only a handful of Alaska's glaciers. It is one of the thickest glaciers in the world at nearly 5,000 feet thick. As the Taku Glacier moves, it excavates up to three meters of sediments every year. These sediments are deposited into the fjord in front of the glacier. Over the last hundred years, these sediments have filled the fjord, which was 100 meters deep, so that the Taku is no longer a tidewater glacier, meaning it no longer calves and loses ice. This research project builds on a study Truffer’s group performed near the Taku terminus ten years ago, which raised as many questions as it answered, says Truffer. Scientists used to think glaciers worked like bulldozers pushing sediments out in front, but there’s more to it than that. The Taku doesn’t bulldoze. It erodes sediment on the glacier side and redeposits sediment on the marine side. By studying how these sediments are deformed, Truffer’s group aims to more closely monitor glacial advance as well as better understand how the glacier is moving and how to interpret sediment left behind by former glacial advances. Truffer’s group began fieldwork at Taku Glacier in March, 2014. They will visit the glacier three times each year to take measurements, perform instrument maintenance, and, in 2014 and 2016 perform detailed seismic surveys. In 2015 the team will focus on collecting data from boreholes. During their weeklong expedition the team used radio echo sounding to obtain high-resolution images of the glacier’s subsurface. During the survey an RES system is towed across the ice on a sled behind a skier. Waves from a transmitted radar pulse travel through the ice to the bedrock and back to the RES receiver. By examining changes in the amplitude and timing of returned radar echoes, Truffer and his colleagues can extract information about ice thickness and bedrock topography. Reflection seismology uses sound waves to create detailed images of geologic structure below the ice/rock interface. During the survey, explosives create a dramatic sound, and the sound waves travel through the glacier and into the rock before returning to 144 microphones, called geophones, laid out on top of the glacier. With a detailed, 400 square-meter survey, Truffer hopes to find out the depth and thickness of sediments under the glacier. Next year Truffer’s team will drill through Taku Glacier to find out how it moves over substrate. To do this, they will drill a set of about 5 boreholes using a hot water drill that will melt a hole to the glacier base. They will insert a tiny packaged set of instruments, still in development, to measure parameters like temperature, ice deformation, and water pressure in ice and basal sediments. An anchor hammered in at bottom of the borehole will pay out line the amount of which will show how far and how fast the glacier is sliding. Global positioning systems (GPS) installed on the glacier surface are powered year round by solar panels. GPSs record glacier motion throughout the year and will help Truffer pinpoint how and when the glacier speeds up and slows down. In the summer, the glacier melts on the surface and this water eventually makes it to the glacier’s bed. This facilitates sliding and generally causes the glacier to speed up. By understanding this dynamic in more detail, Truffer and his team aims to better understand the variables that contribute to this increase in velocity. Field data will be integrated with satellite remote sensing, airborne LiDar and digital photogrammetry of surface streams and the glacier’s terminus. These data, along with observations made during Truffer’s 2004 study and historical data of sea floor topography in Taku Fjord will feed into numerical models that explore the glacier’s response to changing conditions. Truffer’s team has also coordinated with Juneau Icefield Research Program, an annual summer education and research opportunity for high school and college students. 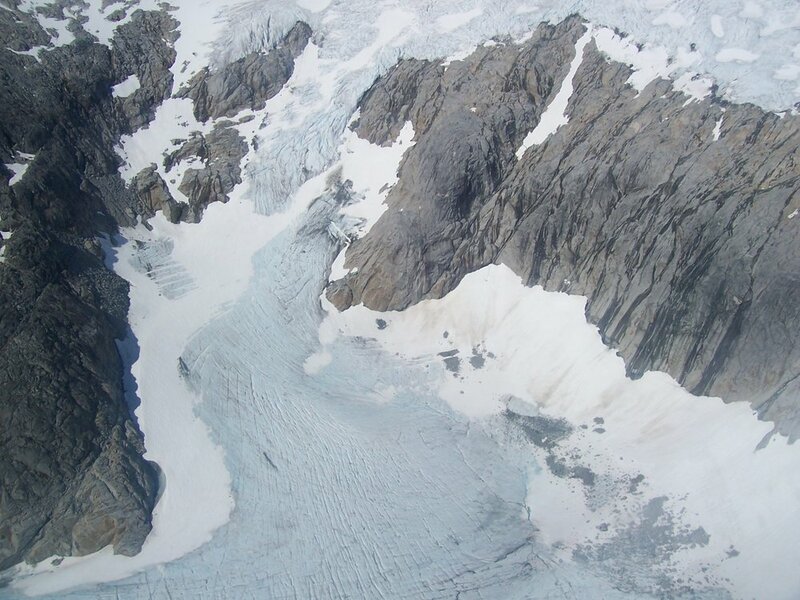 The JIRP has monitored the upper Taku Glacier since 1946. Two groups from the 2014 class looked at the upper glacier’s hydrology and seismic structure. Their data will be incorporated into Truffer’s research, which is more focused on the lower part of Taku Glacier.